“Did you just open Slack?” a new acquaintance asked me on a recent Friday night. Sadly, this scenario isn’t unique to me. The 24-hour workday and the 24-hour newscycle are nothing new at this point, and the data says Americans don’t take vacations, let alone lunch breaks, let alone Slack breaks (no matter the day or hour). “In an endless cycle where communication is stunted and time is money, there are few moments to slip away and fewer ways to find each other,” Jenny Odell writes in her new book, How to Do Nothing: Resisting the Attention Economy. To better understand her version of “doing nothing,” I recently spoke to Odell about why a digital detox is only a half-measure (at best), the profound and existential questions an empty mind can conjure and how NOMO is the new FOMO. How do you define the “nothing” in the book’s title? What are you actually instructing people to do? I’m not suggesting that you do literally nothing. I define it as “nothing” from the perspective of productivity and capitalist ideas of self-worth and personal branding. I define nothing as doing nothing in a purposeful way, in the most obvious sense of the word purposeful. Anything that involves wandering is my go-to for doing nothing. It’s been raining so much up here [in Northern California]; in fact, it’s raining right now. My usual thing is to wander around outside, but I can’t do that right now. If I can’t do that, I like to wander around libraries. I get a similar feeling from it, which is being open to whatever I encounter without having an end goal in mind. I quote Chuang Tzu’s “Useless Tree” story at the beginning of the book. If I totally accepted Chuang Tzu’s philosophy, the purpose of doing nothing would be to just do nothing. Like, I’d just give up on the idea of purpose altogether. But I can’t do that, so it’s something in between. The purpose of doing a certain type of nothing is ultimately to be able to do something. That said, it’s important for me to distinguish that from the idea of doing nothing in order to be more productive, because that’s not what I’m saying either. This is a really important moment in which to disentangle oneself enough to be able to think, reflect and decide what’s actually meaningful to you, and how you can be in this world in a way that feels meaningful. Doing nothing gives you enough time to have such higher-level thoughts. It’s funny that wandering around in real, physical spaces produces this relaxing quality when scrolling aimlessly — that is, the internet version of that — can feel so disgusting after a while. Part of it has to do with scale. Something I really enjoy about being outside, if say, I’m walking up a hill or something, is that I can look at the plants that are right next to me or I can look out further to the trees, or I can look out all the way to the city. Or I can look at a bird that’s close to me or a bird that’s far away. There’s this exercising of different scales of time and space. Whereas when I’m scrolling through something like Instagram, I feel claustrophobic. Everything is just really in my face. In the introduction to the book, you mention how scrolling can produce this anxious or overstimulated feeling. You refer to it as “urgent,” even though it can be hard to fully grasp. What’s urgent about it? I was seeing a kind of disconnect. We live in this terrifying time, and a lot of us acknowledge that there’s so much that needs to be done. I mean, that’s part of what’s driving this anxiety, right? There’s such an awareness of that, but at the same time, I feel like a lot of attention is getting sucked into these platforms. It feels like our attention is disappearing into them, if that makes sense. Like it’s getting absorbed. Mostly through my own personal experience, I’m trying to think about how to connect these two ends. I want to be able to do something or be able to think about something in a certain way, without getting that attention hijacked on the way there. So to me, it’s urgent because there are literally things that are important for us to be doing and talking about right now, and I feel like the way the attention economy works is blocking that. You suggest that while the attention economy has seductively grasped our attention, the actual, physical world seems to be trying to get our attention in serious ways, too — in the form of fires, storms, etc. What do you think about the attention economy’s potential environmental impact in this way? It’s not super cut-and-dry, but one thing I’m interested in is having a relationship to where I live. If you have a certain relationship to the environment and the place where you live, which is something that I frankly didn’t have a developed sense of until maybe two or three years ago, that gives you a different outlook on life. It changes your perception of something like climate change. It goes from being an abstract, big, scary thing that just adds up to a dull, existential dread to a feeling of responsibility. It’s good to know where you are and to be familiar with it — familiar enough to say, “This hillside is eroding,” or “This population of birds hasn’t been returning in the same numbers lately.” It doesn’t make climate change less heartbreaking or scary, but in being familiar with the specific features and inhabitants of a place, it gives you something to grab onto and identify with. Why did you ask your digital design students at Stanford to do nothing for a period of time during class? Why did you consider this a valuable assignment, and how did it go? It’s hard to ask students to do nothing. My current class is gonna be doing this as homework this weekend, but now it’s more of an observation activity. I tell them about this author, Georges Perec, who wrote a short book where he sits in the same place in Paris for several different days and writes down everything that happens. So now I have them do that, too. They’re supposed to sit in a place for 15 minutes and take note of everything they can. Obviously you can’t take note of everything that’s happening around you, so part of the exercise is also noticing what you notice. They seem to still experience this exercise as doing nothing because they’re totally outwardly oriented. They’re only there as an observer. It’s been interesting how surprised they are by how the people around them behave, specifically around their computers and phones. It probably helps their own creativity as well, to experience inspiration and find references in real life rather than just on Instagram, Tumblr, Pinterest, etc. I like how a lot of your art practice is about providing context for what already exists. As an artist, I like finding things more than making them because of that reason. I feel like I frequently see things or read about things from history that I could never make up. What actually happened is as good as it gets. I could never make up anything better than that, so it comes also from my preference as an artist for bringing attention to something that already exists. You refer to social media’s deliberately addictive features. What do you consider those to be on Instagram and Twitter? A big one for me is the risk of falling down the rabbit hole. There’s this phenomenon of going to a site or an app for a particular reason — say you go to Facebook and you just want to look at what time an event begins, and as soon as you get there, you’re immediately confronted with all of this other information that has an emotional valence because it’s your friends, or a moving image or something else really captivating. Oftentimes, you’re just absentmindedly going through the app, but other times, you get distracted from what you’re actually trying to do and risk falling down this rabbit hole. We forget about what we’re doing there. There’s something very unintentional about that, which bothers me. So that’s one big thing — showing up and “boom,” there’s all this stuff in your face. Personally, I find that difficult. Do you think giving our attention to social media or the internet so early in the day is more impactful than doing so later in the afternoon or something. Are there particular times of day that deserve our attention the most? I wouldn’t want to be prescriptive and say that no one should look at their phones in the morning. Personally, I find waking up very important just because that’s when I think about the fact that I’m alive another day. There’s something weird about sleeping, you basically die for a while, so I just sit with that thought for a while. I have no scientific basis for this, but I feel like what you start your day thinking about has an influence on the rest of your day, at least a partial influence. So I do feel like immediately starting off online, in this realm of things you need to be worried about and this overall sense urgency, isn’t the foot I want to get started off on. Do you think that there’s increased pressure to be in the know as a way of feeling that you aren’t apathetic to what’s going on socially and politically? There’s this kind of ambient feeling of obligation to know about everything that’s happening all the time, which is crazy if you think about it. I’ve been thinking about Twitter Moments. I don’t know if you’ve noticed this, but if you go to a Twitter Moment and you scroll to the bottom, it says, “You’re up-to-date.” That phrase, “you’re up-to-date,” is interesting to me. It implies that you always risk not being up-to-date, that five minutes later, you may no longer be up-to-date. If your overarching concern is to be informed in a meaningful way and to be able to contribute something thoughtful to a dialogue or to be able to actually organize or produce some kind of action, being totally disassembled by trying to stay on top of everything all the time might not help you with that. 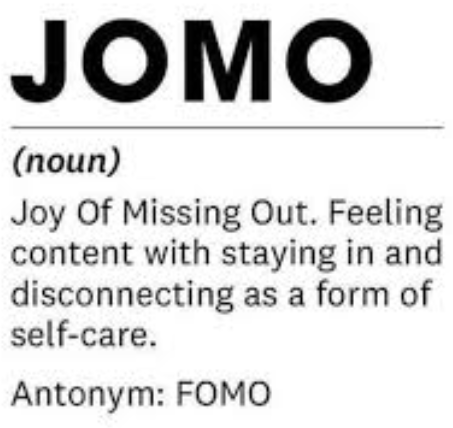 2019 is the year of JOMO, or the Joy Of Missing Out, as opposed to FOMO, which is the Fear Of Missing Out. Yet you talk about NOMO. What is that? The Necessity Of Missing Out. On a very basic level, NOMO is just related to rest — the necessity of rest and reflection and this less active state. It’s amazing to me how little rest some people allow themselves, and how little I allow myself sometimes. I think missing out sometimes is necessary for most people right now. On top of that, being somewhat removed, whether that’s in the short-term or the long-term, allows you to get perspective on the thing you’ve removed yourself from. It’s hard to have broader, more critical thoughts about a situation when you’re caught in the middle of it, so periodically walking away and then looking back at it is good. For me, the metaphor is the walk I go on every week to the top of a hill, then looking down at the place where I live. Afterward, I walk around with a different understanding of the space. It’s not like I’m having an epiphany; it’s about being able to look at my own habitual day-to-day life from the outside and see things about it that I wasn’t able to see before. That’s the most important part of NOMO for me. It’s necessary in understanding what it is you normally spend your time in the midst of. The notion of nothing as an absence or a negation, a suggestion of nothing instead of something, is important to me. That’s why I end the book talking about do-nothing farming. It’s a system of farming that someone came up with in the 1970s, where you remove a lot of the inputs that you’d normally use for rice farming. The system doesn’t use any chemical inputs, it doesn’t have mechanical inputs, it requires less physical labor and it doesn’t require as much water. It’s less of all of those things, but it ended up producing more on the farm, and it’s better for the soil. I love the idea of doing less or just not doing something as an option. Can you discuss the difference between a “digital detox” and the kind of mindfulness or nothingness you’re addressing in the book? The idea of going on a digital detox retreat is bound up with this idea of clearing your head. Like, all you need to do is clear your head and then you’ll be able to work more efficiently. But your ideas about the work and why you’re working haven’t really changed. What I’m advocating for is the kind of doing nothing that gives you time to wonder if you’re even at the right job anymore. Maybe you’re not actually sure. I feel disembodied if I spend too much time online, like my mind is taking over and I’m losing touch with the rest of my body unless I send intentional breath there. It also makes me feel like I’m a colander instead of a bowl, like I’m leaking out all of this energy instead of putting it into something. Do you think it’s weird for us to exist in such a disembodied way, to deprive ourselves of a fuller range of sensory experience? I could certainly see someone arguing the opposite of this. I’m reading Counterculture to Cyberculture right now, and I’m at the part where they’re all obsessed with leaving their bodies and becoming one conglomeration of minds in cyberspace. So that’s maybe like the opposite of me. Personally, I think there’s so much information that comes in the form of smells and sounds and things that aren’t obvious visual cues. I also think the way we think, or what we think of as the mind is way more distributed throughout the body than just being this point in our head. There’s ways of knowing and ways of perceiving that are so beyond the obvious information on a screen, or video playing out on a screen. I guess I worry about missing out on all of that. That seems like living a fraction of your life to me.